Welcome to the TV Roundtable, where some of TV Club’s writers tackle episodes that all deal with a central theme. This is the final installment of this theme: TV we loved as kids. Joshua Alston: My Brother And Me was the first show that popped into my head when asked to think about shows I watched as a kid, because—while I remember watching lots of stuff as a kid—it’s one of the shows I only remember watching as a kid. It had a brief 13-episode run on Nickelodeon between 1994 and 1995 and wasn’t seen again until Nick recently dusted it off in one of its many nostalgic kindnesses, so the first time I watched this show is the only time I did. I could have just as easily written a Memory Wipe, given how little about it I actually remember, and while I don’t see now what I saw then, it’s a far more interesting show to watch with my grown-up, critical eye. My Brother And Me is a garden-variety family sitcom from that era, but it certainly didn’t feel that way then, as it was the first Nickelodeon sitcom to feature a predominantly black cast. I remember feeling like that was a big deal and like it was my duty to watch it. I enjoyed the show, too, though I’m clear the content wasn’t the draw for me as much as simply watching a Nick sitcom about a black family not unlike mine. My Brother follows the Parkers of West Charlotte, North Carolina—a middle-class black family with relatable, mundane problems—and the titular characters are Alfie and Dee Dee, brothers with a typical tough-and-tender sibling dynamic. The closest comparison is obviously The Cosby Show, which ended its 10-season run three years before My Brother debuted. But Cosby had sharp edges because it was informed by Bill Cosby’s stand-up, which was then considered as irreverent about parenting as Louis C.K.’s comedy is today. My Brother’s tone and rhythm are far closer to the Miller-Boyett family sitcoms that were so popular at the time. All the standard parts of the Miller-Boyett template are present here, including the characters: the precious moppet, the moody teenage sibling, the eccentric best friends, and the cheerful-but-authoritarian parents. The humor is kid friendly and relies heavily on catchphrases. Save for the prominence of the child characters, there’s not much to distinguish My Brother from anything in ABC’s once-mighty TGIF comedy block. So what sticks out to me is not how unique this show was but how ordinary it was; its blackness is cosmetic and its novelty is mostly skin-deep. It’s more or less a post-Cosby Full House, which doesn’t aspire to be like Cosby but takes place a universe where Cosby existed. One thing that sticks out to me in “The Big Bully” is Alfie’s wardrobe: He wears two T-shirts from historically black universities, Morehouse College and North Carolina Central University, which had to be a conscious homage to Bill Cosby’s dedication to promoting HBCUs on his show. There are lots of black signifiers here, from the Charlotte setting to the home decor, but because so little of it has any bearing on the actual story, those choices don’t add up to a perspective. The exception to that rule comes in the main plot of “The Big Bully,” and it explains why I chose this episode. Dee Dee finds himself in the crosshairs of a school-yard tormentor named Big Lou; Alfie intervenes and high jinks ensue in standard sitcom fashion. But the scene where Alfie and Goo teach Dee Dee how to deal with Big Lou—how to walk, how to stick out his chest, how to stare down and taunt the bully—veers close to a perspective. It’s a keenly observed moment in which black boys perform black cool. Alfie’s explanation that tough guys don’t concern themselves with grammar makes clear the boys have a gut-level understanding that they are supposed to aspire to a Jim Brown or Billy Dee Williams or Denzel Washington notion of self-possessed black masculinity, but they’re not old enough to think critically about and adapt to those ideas and expectations. That’s also the scene that makes “The Big Bully” My Brother’s funniest episode, thanks to Ralph Woolfolk IV practicing how he’ll taunt Big Lou. I remember me and my friends saying “Hit me!” quite a bit at the time. You’ve never seen this show, right Brandon? What stood out to you? Brandon Nowalk: Remember when there were black families on channels not primarily aimed at black families? I doubt I caught My Brother And Me in its 13-week window, but when we were growing up, ABC’s kid-friendly Friday night lineup was anchored by Family Matters, which I watched religiously. In ’95, three of the four TGIF shows were about black families (Family Matters, On Our Own, Hangin’ With Mr. Cooper), and when TGIF retired, the last one standing was The Hughleys. 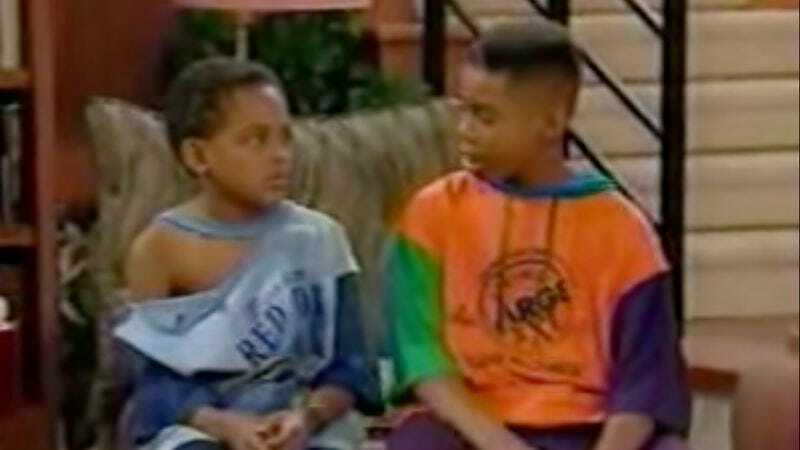 Kenan and Kel or the Mowry sisters were always on when I wanted to watch TV. I haven’t even mentioned The Cosby Show, A Different World, and The Fresh Prince Of Bel-Air. What stands out most watching My Brother And Me in 2014 is how rarely I see or hear about black sitcoms nowadays. The original Parkers were the first black family to move into Nickelodeon. Now, near as I can tell, the last show with a black cast on Nick was Just Jordan which ended six years ago. Cosmetic or not, that matters. What you said about black boys performing black cool strikes me, too. Watching Alfie and Goo teach Dee Dee how to fight, I thought of Troy on Community with his scrapping advice, rising pitch and Forest Whitaker eyes. I daresay that might have scared off Big Lou. I also wrote down that grammar bit (“’Cause you ain’t scared of nobody,” says Alfie, pumping up his brother. “Aren’t scared of anybody,” corrects Dee Dee) as one of the moments that got me. Dee Dee isn’t just missing the point of being cool. He’s actively being uncool. Calling “The Big Bully” ordinary, though, strikes me as a little—but only a little—harsh. The first thing that made me laugh was a surprising stylistic move. Goo puts on his best Eddie Haskell to ask Mrs. Parker how she’s doing today. She says, “Believe me, Milton, you don’t even want to know.” He’s smiling this big broad smile, and suddenly he voice-overs, “You got that right.” It’s delightful. And it happens again later, so I don’t know if that’s just for this episode or a technique used by the whole series, but it’s certainly not something that happened all that regularly on TGIF, as I recall. Also the goofier bits—like the laundry montage (which I think might still be going on) and the first-person bully attack—stick out as the kinds of things that might happen on quirkier shows like Clarissa Explains It All but not many “normal” family sitcoms. That probably has to do with this being a kids’ show, but the inner-monologue joke is imagination at work. I didn’t laugh much, because the story is pretty predictable, but I was charmed by a few moments, mostly with Alfie. His go-for-broke mumbling performance on the phone to his crush gave me post-traumatic stress flashbacks. At the end he redeems himself, but it’s just as funny to see him acting all cool sitting there in his pajama set, swallowed up by a giant chair, legs crossed in an expression of absolute relaxation. Yeah right, Alfie. I also loved the tandem bit when Alfie and Dee Dee both return not dirty but filthy from the fight with Big Lou and her older sisters. Their parents ask what happened. They just stand there and say in unison, “girls.” That goes double for Alfie, beat up literally and figuratively by Toya in the same episode. As for the other girls, Melanie’s bitterness is way over the top for my tastes—speaking of Miller-Boyett templates, I wonder if I’d feel like that about Step By Step’s Dana if I revisited—but it’s worth it just for her friend, Deonne, whose rambling I could listen to all day. Now, has anyone but Joshua seen the show before? And is anyone else as big a fan of Deonne speculating about an old suit? Pilot Viruet: I have seen this before! I thought I hadn’t because the title didn’t ring a bell, but the second the theme song kicked in, I remembered watching this show as a young kid. I also remember this specific episode because that shot of Dee Dee saying “Hit me!” repeatedly was familiar. My Brother And Me had to have been one of those shows that I watched with my older brother. I can’t say that I thought much about the predominantly black cast, but that’s probably because I didn’t realize it. I’m not claiming that I don’t see color, but as a black 6-year-old who often sat with her black family and black friends watching Family Matters, Hangin’ With Mr. Cooper, and The Cosby Show, a cast like My Brother And Me would feel like the rule and not the exception. How weird is that? And how sad it was to start watching more and more sitcoms and realize that’s definitely not how television works. But I’m glad you reminded us of this show, Joshua, because it was so much fun to revisit! I remember that the show was less about a black family and more about just a family—it didn’t erase the Parkers’ race, and it doesn’t really “transcend” race, but it didn’t make it the sole focus of the show, either. But that’s not totally the case in “The Big Bully,” as you point out, Joshua. I think the advice to act cool and tough would be given to any nerdy kid dealing with a bully, regardless of race, but there are definitely some added layers here. The end reveal wasn’t that much of a shock (the “bully is actually a girl” thing has been done to death, though I’m sure I found it absolutely groundbreaking and hilarious in 1995), but it still lands. Not only is Dee Dee being bullied by an older girl, but she then gets her older sisters to fight Alfie and Goo. The brothers’ “Girls!” response was a bit cheesy, but also resulted in me laughing out loud. I remember the interior monologue existing throughout the series—and how well it remarked on the sarcastic thoughts kids have but can’t actually say to their parents. The parents were largely absent this episode, save for that laundry montage and the dinner scene, and that was something I quite enjoyed because it makes My Brother And Me more about the kids than anything else. Sonia Saraiya: What is this time capsule you’ve found, Joshua? I’ve never seen this show, and I have no idea how I missed it. I must have been watching Nickelodeon 24/7 in the 1994-95 television season. It might be telling that I don’t remember a single frame of this show, and it sounds like Brandon doesn’t either, while both you and Pilot have at least some memory of it. I watched a lot of Nickelodeon—or at least, I thought I did—but I didn’t watch this. Especially compared to the episode of Clarissa Explains It All we watched, this is a much slower episode. There are no visual effects, no cut-away references, no direct-to-camera monologuing. That could be a bad thing—it certainly means that My Brother And Me doesn’t really grab the viewer until several minutes in, and even then, it makes less of an impression than the quirky Clarissa. But even though its jokes don’t land quite as well for an adult audience (they’re telegraphed practically hours in advance), there’s something nice about how un-self-conscious this episode is. It strikes me that this is a low-impact show that is offering a normal narrative of middle-class kid life with one important twist: The kids are black. The interior of the house, as was often the case in the ’90s, doesn’t feel aspirational, but in fact a little shabby—neat, but a little dated and run-down, as is the case with many of our own houses. And the hook of the show is exclusively these brothers’ relationship with each other—most of the episode is them just talking to each other. I’m not compelled to watch a whole bunch of episodes of this show right now, but I can see how as a kid this would have been a very low-stress introduction to the obvious truth that black kids were just like me (and of course for black children, the subtext of identification is even stronger). It’s a slice-of-life show—which makes sense as part of Nickelodeon’s lineup, as they already had kids watching eight hours a day, and didn’t need to worry about finding some kind of obvious viewership hook. In the past few months I’ve been hearing about an upsetting, if unsurprising, phenomenon: Black children are more likely to be viewed as older and less innocent than they actually are. With black girls, the public eye tends to find them sexualized at far too early an age; with black boys, the research specifically found that police are more likely to use force. Anyone who is at least glancingly familiar with the long history of murder that follows young black boys, from Emmett Till to Trayvon Martin, will not be surprised. But to me, it offers a window into why something like My Brother And Me is important, even if it’s not as technically brilliant as some of the other shows in TV Roundtable. All of the shows we’ve discussed here—from ABC’s TGIF lineup or others that now no longer exist—offered a vision of black youth that aren’t denied their innocence. In My Brother And Me, Alfie on the phone asking Toya for a date, and Dee Dee not wanting to talk about being beat up by a girl, and then both of them together cleaning up suds with their dad, are all together the essence of naive childhood. It also is a vision of progress that the world perhaps wasn’t ready for. I have to out myself: Maybe as an elementary-schooler, I avoided his show precisely because it was about black kids. I don’t know if I did. But I do know that my childhood was a lot about trying to be white (for a variety of depressing reasons), and perhaps that filtered down to my choice of television shows. I didn’t know any black families in my neighborhood, and no black kids went to my school. The middle class is shrinking, and the black middle class most of all. Is that why My Brother And Me only got 13 episodes? Is that why Family Matters and Fresh Prince don’t have any modern successors? JA: The reason there’s been no recent successor to shows like My Brother And Me, Family Matters, and Fresh Prince is the same reason “The Big Bully” struck me as ordinary—which is probably a little harsh, but I certainly don’t mean to pay the show short shrift. It’s just that My Brother And Me represents an earlier leg in our societal migration toward a better understanding of difference. We’re evolving past the need for a show that serves the function this one did—though at a glacial pace and with considerable growing pains. The broader goal of mitigating our societal disharmony starts with recognizing commonalities, and ends with learning how to celebrate and accommodate differences. We’re inching toward the latter phase. When My Brother And Me was on, it served an important function at the time. I’d imagine that for a large swath of the Nickelodeon audience, Alfie and Dee Dee were the first black kids invited into their homes, and that’s a big deal. Like other shows of that cohort, My Brother And Me showed the Parkers were basically the same as a middle-class family of any other race. The shortcoming of a show like My Brother And Me is that calling attention to similarities does nothing to prepare us for differences, and that’s the hard, worthy work. Broadly, human beings are the same, but there are also a shitload of differences predicated on all manner of influences. So while there’s value to the “other people are just like me” idea My Brother trades in, that has to be supplanted by “other people actually aren’t just like me, but that’s okay too.” Without the second phase, the audience is left with the insidious message that there’s a direct relationship between another person’s humanity and their similarity to you, which is obviously a dangerous idea. My Brother debuted in 1994, during the primordial stages of this ongoing consciousness shift, and that probably played a part in the brevity of its run. I read somewhere My Brother was actually renewed, but its second season fell apart during pre-production discussions about the creative direction, and I’d love to know what those conversations sounded like. I’d imagine they weren’t terribly different from the discussions happening behind the scenes of All-American Girl—Margaret Cho’s 1994 one-season wonder about an Asian family—which, according to Cho, collapsed creatively in large part because the producers and the network could never agree as to whether the show was “too Asian” or “not Asian enough.” It’s quite possible the My Brother creative team wanted to push the envelope further, but wasn’t given the latitude to do so. In the roughly two decades since My Brother and its black family-sitcom ilk, we’ve grown out of sitcoms that only achieve observations of commonality, both as a sociological tool and as entertainment. I’m a big a critic as anyone of the notion that Barack Obama’s ascendance to the presidency has ushered in a “post-racial society,” but I’d certainly argue that Malia and Sasha have obviated the need for Alfies and Dee Dees. And given the hyper-fragmentation of the medium, television shows need unique perspectives to survive. That’s why there’s no room for a My Brother anymore, but there is room for ABC’s forthcoming Black-ish, for example, which boasts a premise designed to mine material from difference rather than similarity. Interestingly, reality television evolved in exactly the opposite way: In its early days, with the earnest, pre-Las Vegas The Real World as its watershed, reality television thrived on difference. The whole draw was watching people—measurably different people—figuring each other out and learning that difference isn’t the worst thing in the world. Anyone who’s seen the first season of The Real World can attest to how delightful it is to watch Heather Gardner, the rapper from Brooklyn, forge a friendship with Julie “Fresh Off The Turnip Truck” Gentry, not because there were so many similarities between the two, but because the differences were properly contextualized. The Real World grew into a cultural phenomenon after it debuted in 1992 because the audience was ready for it, especially with its premiere coming just weeks after the Los Angeles riots, when our divisions felt especially pronounced and deserving of exploration. But of course, the audience grew accustomed to the novelty of a diverse group sharing a loft, so its producers decided to refocus on the common experience of wanting to get drunk and copulate. As lamentable as is reality television’s slide from substantive conversation to manufactured “drama,” that shift happened because reality television so quickly introduced and popularized a narrative framework around cultural differences, a concept scripted television is still fumbling through. If a reality show premiered now resembling The Real World’s first season, it would look hilariously quaint. But viewed today, My Brother And Me merely feels of-its-time, and if it debuted tomorrow, it would feel dated because of its beige comic sensibility, not its perspective. That’s a powerful sign of how far scripted television still has to go if it wants to more accurately reflect how today’s audience regards and examines difference. SS: That’s a mic-drop if I’ve ever seen one, Joshua. BN: It’s certainly not for lack of demand. African-Americans are the largest non-white TV audience in the country, and according to Nielsen, African-American households will have a projected buying power of $1.1 trillion by 2015. Other studies find that black consumers show greater brand loyalty than other consumers. Sounds like a valuable consumer group to me. There’s no reason this demographic couldn’t be sold to. Put it together and what have you got? An audience with disposable income that media companies perceive as primed for commercials—particularly in conjunction with content about black people—that nobody is serving. The bigger networks have shunted black programming off to the smaller ones, and then to cable, and now even those have dried up, leaving behind a shallow puddle of cheap reality programming for the declining mass audience. I don’t see My Brother And Me as something the world wasn’t ready for—I’d say Joshua nailed it with “post-Cosby Full House”—but we certainly don’t have anything that looks like it on TV today. SS: This idea of television working from understanding each other’s similarities to processing inevitable and inherent difference resonates quite strongly with me. To bring the conversation down a level, the discussion of diversity in Girls was such a firestorm because it was trying to reconcile two very different ideas of what it means to be authentic or inclusive. I myself was not thrilled at the way the writers handled casting for that show even after they realized they had a problem, but I can see how they might have been scared off by the complication of it. It’s a cop-out to just ignore the issue of race on television—but I get the impulse to do so, because this is not easy. Can a TV show teach us how to understand each other? Roger Ebert said that one of the reasons he believed so passionately in film is because he saw them as “empathy machines,” and I think that can be extended to many types of creative work—especially in mass media. But it’s tricky. So much of art, creative or otherwise, is the narrators pleading with the audience to understand their plight—whether that’s a drug-dealing, cancer-ridden 50-year-old or a self-absorbed 24-year-old writer in Greenpoint. They do that by appealing to our common humanity. And yet even those shows, the Breaking Bads and Mad Mens and Girls of the world, inspire a lot of anger and judgment of its characters—even when the showrunners are hoping to produce empathy. We are not, as a species, very good at processing difference, even in contexts where that is in fact the point. It’s funny you mentioned Black-ish, Joshua, because the trailer for that show made me wince more than once. I like the idea, and as you point out, Brandon, there’s an enormous untapped market for entertainment that prioritizes black experience. But every time I see something like this, it makes me feel like I’m participating in the exploitation of someone, even if I don’t always know whom. Because it’s not quite so harmless, tossing around jokes about blackness and whiteness in a family setting—there are real social ramifications there. All of this makes me think of a bit from Kroll Show, which is often one of the most astute critiques of modern television out there. It’s a reality-show bit, where one of Nick Kroll’s recurring characters, Jeff (an NBA referee), wanders into a reality show called Making Friends and is the only one there who genuinely wants to make friends. The rest of the characters (including a man named Tony, whose chyron identifies him as “Black Man”) immediately drop into aggressive, bitchy, reality-show behavior: “I’m not here to make friends.” “That is just your opinion.” Jeff earnestly tries to make friends, as that is the mandate of the show. He is immediately voted off. We’re all idealists here, clearly. But it’s difficult to see how to move forward with managing something as fraught as race relations on television, when every avenue feels exhausted. It appears that no one is here to make friends.